VS series monitors are usually used in the office environment with embedded power adapters into the design while still remaining slim and stylish. They are VESA compatible, which means you can neatly place it on a wall. Compared with non-LED backlit monitors, these VS monitors are LED backlit delivering brighter displays, and deliver Full HD quality visuals. Featuring an ultra-fast 2ms response time, they provide smooth motion playback for videos and movies. As a dynamic contrast ratio to measure how dark a screen can get, ASUS Smart Contrast Ratio (ASCR) delivers a more defined image especially while watching night scenes in movies, playing games, or giving presentations with high dynamic contrast ratios of 50,000,000:1. 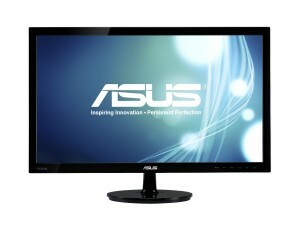 ASUS Splendid Video Intelligence Technology that comes with different scenario settings ranging from game to scenario modes is a quick image setting selectable through buttons on the monitor. You can choose one you like most for your task. With the latest in display technology, VS series monitors are able to connect to your devices with an assortment of options. You will get more options for customizing your PC setup like setting up multiple displays with more inputs. HDMI connectivity offers both high-definition audio and video in one streamlined cord to external monitors, projectors, and compatible TVs.